Patients of Dr. Alan J. Bauman, MD, ABHRS describe their experience with the hair growth medication in these Formula 82M reviews. How do Bauman patients rate Formula 82M? Read the Formula 82M reviews below to find out. Minoxidil has been FDA approved for more than 30 years, but over-the-counter versions are generally weak and leave a greasy, gooey residue on the scalp which interferes with hairstyling and can cause irritation. 82M contains minoxidil, tretinoin, fluocinolone, powerful antioxidants, natural hair nutrients, a hair conditioner and a scalp conditioner. This specific formula allows for quick absorption and powerful penetration of the FDA-approved drug minoxidil, a reduction of the micro-inflammation associated with hair loss in a non-greasy, hair and scalp-friendly lotion. 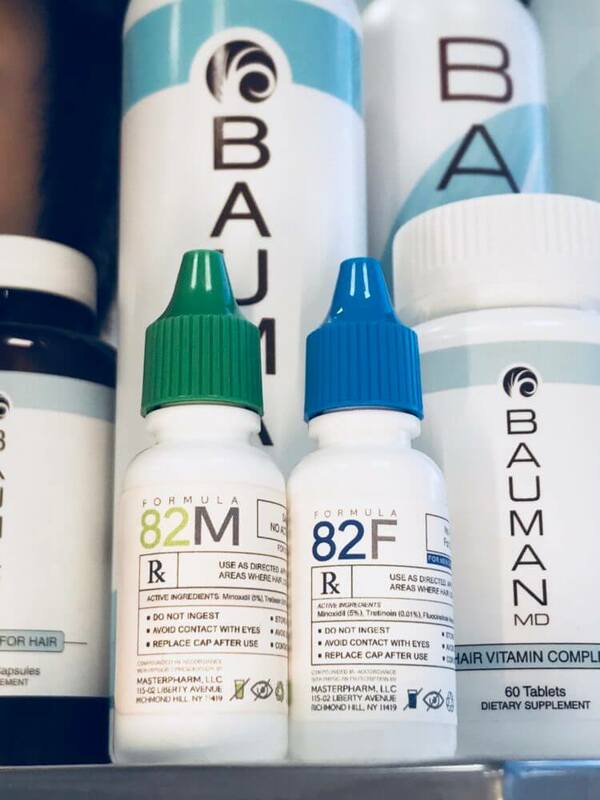 However, the most important things to know about Formula 82M is NOT just the list of synergistic ingredients, but the fact that the compounding and preparation process allows for a powerful, easy-to-use treatment that doesn’t interfere with your hairstyle or lifestyle. 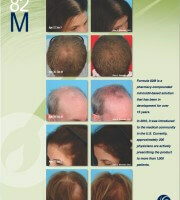 Formula 82M Compounded Minoxidil is specifically designed for hair loss patients who experienced the hassle of annoying scalp and hair side effects from over the counter minoxidil 2% or 5% solutions, foam, generic-brand (e.g., Kirkland) or name-brand Rogaine, but are still looking for a powerful topical hair growth treatment they can do at home. Dr. Bauman has successfully prescribed and measured the results of Formula 82M in literally thousands of patients for more than 15 years. Compounded Formula 82M has been proven to slow, stop and even reverse the gradual miniaturization of hair follicles associated with male and female pattern hair loss and generalized hair thinning. How Do Patients Rate and Review Formula 82M? 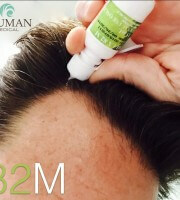 Learn more about compounded minoxidil in these Formula 82m reviews and ratings from hair loss patients–Formula 82M is a powerful, quick-dry, “rogaine alternative” which is less greasy and leaves no annoying residue on the scalp or hair. 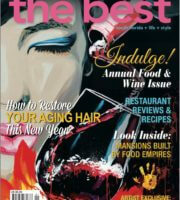 Results can be measured in as little as 90 days with HairCheck and visual improvement is seen typically at 6mos. Formula 82M can be used as a stand-alone hair growth treatment or in conjunction with laser therapy (LaserCap/Capillus), finasteride/propecia, FUE hair transplantation (SmartGraft or ARTAS) and PRP w/ Extracellular Matrix (ECM). Is Formula 82M Compounded Minoxidil right for you? Ask Dr. Bauman or request a Virtual Consultation today!